Here is another posting of customer pictures. This time, it’s of our Ranger RML750HD Motorcycle Lift. This is our most popular motorcycle lift of all the different models we carry. And why not? It’s got the best features, the greatest lifting capacity (1650 lbs) and the highest lifting height (43 inches). Plus it has retractable casters so you can roll it around, even when your bike is loaded on it! You’ll find that most motorcycle / ATV lifts lift only to a height of about 36 inches or so, and have a lifting capacity of only 1000 lbs. The typical ATV lift design has wheels that roll along the floor, but this Ranger motorcycle lift scissors up inside it’s own frame, which allows for the portability, along with a more stable footprint and a heavier lifting capacity. It comes bundled with the side extensions, rear support poles, the two approach ramps and the power unit can be powered by air, or when your compressor is not available, you can manually pump it to raise and lower it. The picture shown below is provided by Jeff Holt from American Motorcycle Group out of Anaheim, CA. When they needed a bike lift, they came to us because they knew we would hook them up with the best product for their application. Call us at 800-229-6218 to learn more about this great lift, or visit our web site at ASEDeals. A very popular product with ASEdeals.com customers over the past 5 years or so is the Ranger RML750HD Motorcycle Lift. This can be attributed to several reasons. First, The manufacturer is Ranger Products, a division of BendPak, Inc. They are one of the top names in the automotive lift business. They’ve been around for over 40 years and have a great reputation for quality and reliability. Next, the RML750HD Motorcycle lift has many great features that are not typically found on most motorcycle lifts / ATV lifts on the market these days. For instance, it lifts significantly higher, up to 43 inches. Most lifts only raise to approximately 36 inches. It also has a greater lifting capacity of 1650 lbs. Most lifts have a lifting capacity of 1000 lbs. It also has two different approach ramps. A wider, steeper ATV approach ramp, and a longer, narrower motorcycle approach ramp. It can be powered by air, or hydraulics alone. So if your air compressor is down, you can still power this thing. It also has retractable casters, so you can roll it around even while it’s loaded. This is a handy feature. It also has a unique feature in it’s rear support poles. You can run straps down from the hooks on the poles down to the bike’s frame, so that you can free-wheel the rear wheel. Included as standard with the lift are the side extensions, the wheel vise, the rear support poles, the drop-out panel in the rear, and the two different approach ramps. Here’s yet another installment of ASEdeals.com customer pictures and testimonials. Many of our customers love seeing this type of correspondence at times just to see what other people are doing with this type of equipment, and others to get a better idea on what other applications there may be for the equipment. 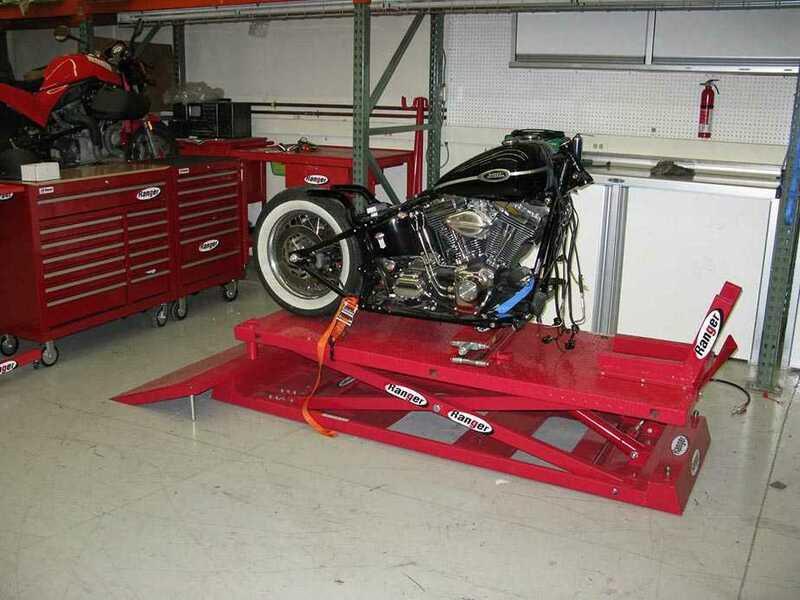 In this case, the customer sent in some images of the Ranger RML-750HD motorcycle lift, along with his prized possession 2003 Harley-Davidson motorcycle up on the lift. Customer Spencer Olson of OD Cycles and Performance said, “The lift is here and already has had several bikes on it within the first hour. I have included two pics with my ’03 Ultra on the lift. Thanks for a great product and I look forward to doing more business with you in the future”. It is Heavy Duty. It has a full 1600 lb. capacity. Most lifts of this type are typically 1,000 lbs. capacity. It Lifts Higher. It lifts up to 43 inches. Most models only lift up to 30 to 36 inches. It comes with all the accessories. These include the drop-down panel in the rear to allow you to free wheel your bike. Also included are the side extensions, wheel vise, and two different approach ramps, the wider, steeper ATV approach ramps, and longer, narrower motorcycle ramp. It can be powered by air or hydraulics. Most models are powered strictly by air alone. 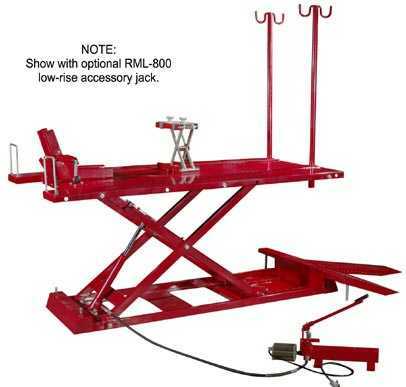 If you are out in the field, or if your air compressor is down, you can still use this lift. It has retractable casters. So you can roll it around even while it’s loaded!. Check out the pictures below and contact us at 800-229-6218 with any questions. You are currently browsing the archives for the Motorcycle Lifts category.